The Rasterbator (free) is a very good program for printing out large rasterized images--images made up of small dots--on a normal printer. With it, you'll be able to take photos and other images and create banners, posters, and other large images. They won't look precisely like the original, and will instead have a kind of "arty" feel with a very moody, atmospheric look. The Rasterbator creates the image on several printed pages. You'll then have to assemble the final image by pasting together the individual pages. The Rasterbator lets you print out posters and banners from any image. Run the program, choose the photo you want to print, and then select your options, such as the number of pages you want the image to be composed of. (The more pages, the larger the image.) 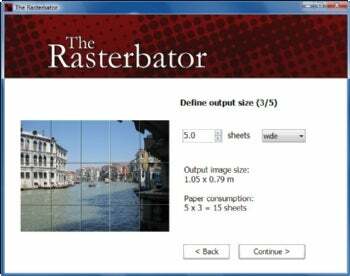 The Rasterbator then goes to work, and launches Adobe Reader so that you can print out the pages. Select your printing options in Adobe Reader, print out the pages, and then assemble the final piece. This may sound simple, but it's not always that easy to do. One issue is that The Rasterbator gives no guide as to which pages need to pasted to which. When you see the printouts, you may be confused, because the images are rasterized and made up of dots. They won't look just like your image. So you'll have to spread all the pages out, and figure out how to do it yourself. In addition, you'll have to test out various settings, depending on your printer and the photos you'll be printing. In my tests, I found that it worked best when to choose "Choose 'US Letter'" when asked for paper size. And the 5 mm dot size worked much better than the 10 mm default dot size--at a 10 mm dot size, the images didn't come out properly. Also, I found that simple images worked far better than complex ones. Photos of faces, for example, worked very well, while complex landscapes did not. Another tip: When printing the pages in Adobe Acrobat, make sure to choose "Fit to paper" in the Page Scaling options; otherwise it won't work properly. And if you decide to print using horizontal alignment, make sure to select "Auto-Rotate" and "Center" Again, though, you'll need to test the settings yourself, to see which works best for your printers and images. For more tips, head to the developers' FAQ. If you need to print posters, banners, and are willing to put in the work, you'll most likely be pleased with The Rasterbator. Just be prepared to do some fiddling with it.